Onkyo DP-S1 review | What Hi-Fi? Looking at the Onkyo DP-S1, we get the feeling we’ve tested it before - the player’s design is incredibly similar to the recently-released Pioneer XDP-30R. Pioneer sold its AV division to Onkyo in 2014, and each company has put its own spin on a similar design theme since. But just because something looks the same doesn’t mean that it will sound the same, and the DP-S1 has a few differences that give this player its own individual flavour. On the surface, just a few cosmetic changes set the DP-S1 apart. The lock button, which stops its touchscreen being activated, is circular rather than square; the word ‘Balanced’ is highlighted, signifying the player’s 2.5mm headphone jack. Those with unbalanced headphones, fear not - there’s a conventional 3.5mm socket too. On the lower half of the fascia are etched some of the specs of the player: 16GB of internal storage (which can be increased to 416GB with a couple of 200GB MicroSD cards), support for 32bit/192kHz music files, and its twin SABRE ES9018C2M digital-to-analogue converters. Onkyo has fitted two clocks – one for 44.1kHz files, one for 48kHz – which it says ensures superior timing and better sound quality overall. And alongside wi-fi, the DP-S1 also has Bluetooth connectivity so you can stream audio to wireless speakers. 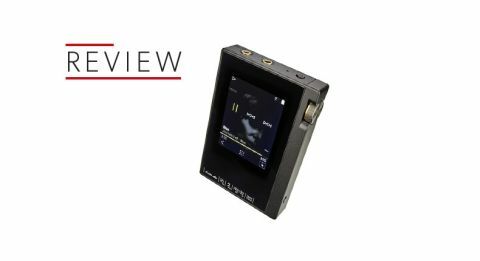 There will also be support for MQA technology, which compresses hi-res files into a lossless format that’s easier to stream, in an imminent firmware update. Using the player is more fiddly than some others we’ve tested. The 2.4in, 320 x 240-pixel touchscreen is perfectly fine when hitting the large digital tiles to get to your music library, but it’s a little more challenging when typing in email addresses and passwords to log into its streaming services. It offers Tidal and Deezer, as well as TuneIn internet radio. On the whole the user interface is relatively simple, although we would like a searchbar implemented. While we can understand its omission on players controlled only by physical buttons, no-one wants to be scrolling through an alphabetical list of a few thousand songs just to get to, say, Xanadu. There is a dedicated app which lets you control the player from your phone - but if both are sitting in your pocket then it’s not an inherently faster experience. It is quite useful if you’re away from the player for any reason, though. Onkyo has said the DP-S1 has more refined sound quality than the Pioneer XDP-30R - and while we wouldn’t say that its performance is significantly better, there are tangible differences. It’s like sitting down for one of your favourite meals, only to find that someone has switched the seasoning. The main modification concerns the Onkyo's greater spaciousness, and the greater fluidity to the way it handles dynamics. Loading it up with Mahler’s Symphony #2 In C Minor – also known as the Resurrection Symphony – we find dynamics rise and fall with slightly more eloquence than with the Pioneer. The Austrian composer’s earth-moving strings are whipped into short, controlled bursts at the beginning of the track, and there’s clear delineation between where the notes begin and end. Changing to I Like Birds by Eels finds Mark Everett’s vocals given a little more space away from background instruments when compared to the tighter-focused Pioneer. Everything is kept organised, as this player maintains a firm hand on both the main vocals and the backing harmonies - ensuring no one part of the song infringes or clouds another. In terms of detail, there’s plenty of subtlety and insight in this player. The melancholic tones of Nick Cave and the Bad Seeds’ Girl In Amber come across clearly, close attention paid to each strained intake of breath and natural hiss as Cave’s sibilant lyrics slip out – and although there is even more fine detail to be eked out of the track, the DP-S1’s best is still thoroughly enjoyable. But unfortunately for this Onkyo, standing in the way of a five star review is Astell & Kern’s AK70. Our 2016 Award-winner is punchier and more dynamic than the Onkyo, and even more detailed – it is entirely worth the extra £100. There’s a lot to like about the DP-S1. It’s nice to hold, generally easy to use and gives a valiant performance no matter what you’re playing or what you’re playing it through. But there’s still a little way to go before it’s going to topple the class-leader.